My favourite month of the year. As a passionate Melbournian there are many reasons why September is exciting. Firstly it marks the beginning of Spring! Hooray! Even though I enjoy knitting all those winter woollies, I do love the sunshine. Spring brings blue skies, blossoms and of course lambs. Gorgeous sweet baby lambs... (see it really is about the wool). Also Fathers Day, the first Sunday in September is Fathers Day for Australia. I trust you all celebrated as appropriate to your family a Dad or Father figure. I didn't actually see my Dad this year, but chatted on the phone. We are catching up next weekend. Combining the above two elements, I actually found this photo yesterday. So young! The image is super grainy - it's a photo of a photocopy, but lets just pretend it's arty, ok! 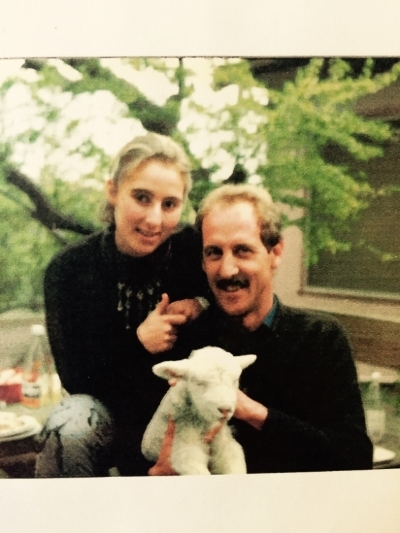 My Dad and me with a baby lamb... circa 1980s? Other things I love about September are the AFL Grand Final... although they've mucked it up this year by making it in October. I really do love football, but as a Carlton supporter, this year has not been memorable. I love the flowers of spring in September... especially Freesias.. anything perfumed really. I'm not allergic to anything and don't suffer hay fever like many, so all the pollen doesn't bother me at all. Of course the most exciting thing about September for me is MY BIRTHDAY! This year is really special as I celebrate turning 50 on the 14th of September! Hooray. So that's going to be a memorable day. September really is a month of new beginnings, new life and celebration for me. Send me some of your favourite spring photos if you like - I can feature them on the What Jane Knits Instagram page... or just tag #whatjaneknits.